Image noise can compromise the level of detail in your digital or film photos, and so reducing this noise can greatly enhance your final image or print. The problem is that most techniques to reduce or remove noise always end up softening the image as well. Some softening may be acceptable for images consisting primarily of smooth water or skies, but foliage in landscapes can suffer with even conservative attempts to reduce noise. This section compares a couple common methods for noise reduction, and also introduces an alternative technique: averaging multiple exposures to reduce noise. Image averaging is common in high-end astrophotography, but is arguably underutilized for other types of low-light and night photography. Averaging has the power to reduce noise without compromising detail, because it actually increases the signal to noise ratio (SNR) of your image. An added bonus is that averaging may also increase the bit depth of your image — beyond what would be possible with a single image. Averaging can also be especially useful for those wishing to mimic the smoothness of ISO 100, but whose camera only goes down to ISO 200 (such as most Nikon digital SLR's). Image averaging works on the assumption that the noise in your image is truly random. This way, random fluctuations above and below actual image data will gradually even out as one averages more and more images. If you were to take two shots of a smooth gray patch, using the same camera settings and under identical conditions (temperature, lighting, etc. ), then you would obtain images similar to those shown on the left. Even though the average of the two still fluctuates above and below the mean, the maximum deviation is greatly reduced. Visually, this has the affect of making the patch to the left appear smoother. Two averaged images usually produce noise comparable to an ISO setting which is half as sensitive, so two averaged images taken at ISO 400 are comparable to one image taken at ISO 200, and so on. In general, magnitude of noise fluctuation drops by the square root of the number of images averaged, so you need to average 4 images in order to cut the magnitude in half. The next example illustrates the effectiveness of image averaging in a real-world example. The following photo was taken at ISO 1600 on the Canon EOS 300D Digital Rebel, and suffers from excessive noise. Noise reduction with Neat Image Pro Plus 4.5 uses default settings and "auto fine-tune"
Note how neat image plus averaging is now able to both retain the vertical detail in the bricks and maintain a smooth, low noise look. 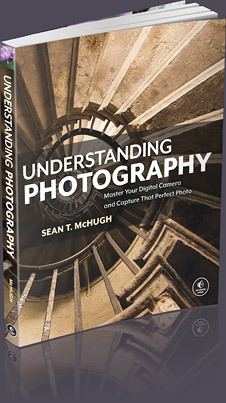 Disadvantages of the averaging technique include increased storage requirements (multiple image files for one photo) and possibly longer exposure times. Image averaging does not work on images which suffer from banding noise or fixed pattern noise. Note how the bright white "hot pixel" in the lower left of both the top and bottom images does not diminish with averaging. Averaging, unlike other shots, requires zero camera movement *between* exposures in addition to during the exposure. Extra care should be taken with technique and averaging can only be used for photos taken on a very sturdy camera tripod. Performing image averaging in Adobe Photoshop is relatively quick using layers. The idea is to stack each image in a separate layer, and have them blend together such that each layer contributes equally. 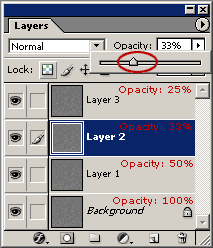 If for some reason one layer receives more weighting than another, the blending of images will not be as effective. they will not actually be visible in Photoshop. For situations where you cannot guarantee interruption-free exposures beyond a given time. 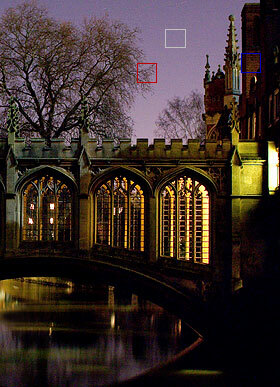 As an example, one might be taking a photo in a public place and want low noise, but cannot take a long enough exposure because pedestrians often pass through the shot. You could then take several short shots in between passers-by. To selectively freeze motion in low detail, faster moving areas while still retaining low noise in high detail, slower moving areas. An example of this is a starry night with foliage in the foreground. To reduce shadow noise (even in low ISO shots) where you wish to later bring out shadow detail through post-processing.